I have this little Dell Mini 9 Hackintosh that has been quite fun and useful for when I’m running around doing BarFly business. It’s easier than lugging around my main laptop, and it’s easier for entering happy hour info than using my iPhone. However, the keyboard recently went out on me. It was quite odd, I’d his the “A” key, and it would trigger “QAW”. I’d hit the tab key, and it would toggle Caps Lock. Hitting “A” again would them display “qaw”. Pretty silly. It turns out, replacing the keyboard is cheap and simple. I saw some listed for as much as $35, I got mine in an auction for around $19. Once it arrives, you are all set. There are two big tabs on the backside, pretty hard to miss. 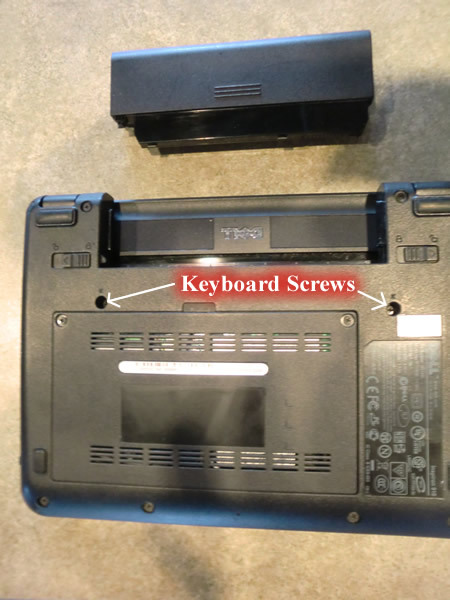 Step 3: Remove the keyboard screws. There are two of them. This is all you will need to remove. Be careful, don’t lose them. Flip the Dell Mini right side up, open up the monitor, and very gently wiggle the keyboard lose. You may need to use some leverage to pop it out. Be careful, there is a ribbon attached to the keyboard. You will see either grey or brown slider locks on the keyboard ribbon. Gently slide them away from you, towards the monitor. It can be a bit tricky, just be patient. Make sure the latch locks are still slid out, and meanwhile, insert the keyboard ribbon. Latch the locks. 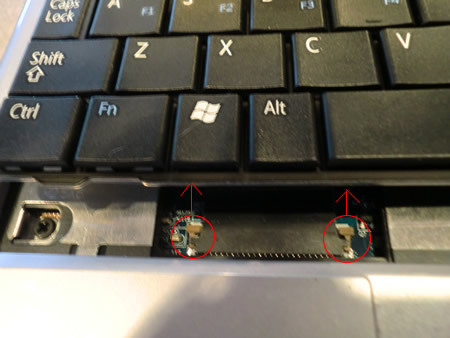 By all, I mean, put the keyboard screws back in and then slide the battery back in place. Voila. You are done. Should have taken 3 minutes, max.